Returning to "A Shining Example of Democracy in Africa." THE GAMBIA, a thin country in size that takes its name from the river running through it, lies on the Atlantic coast of Africa. In 2017, a seismic crack formed on the country’s historical surface: the 22-year virtual dictatorship of Yahya Jammeh on one side, and a return to democracy under President Adama Barrow on the other. Jammeh had initially refused to accept the result of the 2016 election that ousted him, but when neighboring West African leaders sent in troops to force him into exile, he capitulated. Thus avoiding the bloodletting that so often results from such power shifts in Africa. What was inescapable, however, was the phase of uncertainty that Gambians now face, as the battered and impoverished nation tries to pick up the pieces and restore governance and a functioning economy. Re-building the country’s economy to meet high expectations, especially those of young Gambians, has proven a more difficult challenge than other reforms. Revenue in the country depends heavily on groundnut crops and production, which makes up six percent of the GDP and more than a third of Gambian exports. Tourism, another income source, is showing more promise than ever before. In early 2019, a new bridge over the 700-mile Gambia River was inaugurated, river cruises stopped at Baboon Island, home of hippos, crocodiles, and Africa’s oldest center for rehabilitating chimpanzees into the wild. Complementing while simultaneously supporting this growth in tourism, new direct flights from Europe will be in operation. Remittances from the many Gambians who emigrated to find work and escape from the Jammeh regime have long buttressed the economy. However, remittances are expected to decline as a leading source of revenue as Gambians return home under the new regime. Contact with international financial institutions, such as the World Bank, severed under the old regime, has been re-established; but what Gambia seeks is investors to enlarge its economic and employment base. China, already very active in Africa, has stepped in with agreements to invest in infrastructure and education. Ambassador Fadera reports little response from U.S. investors as of yet, even though, overall, bilateral relations have improved since the change. The State Department no longer lists Gambia among the countries refusing to accept the deportation of Gambian illegal immigrants from the U.S. (around 2,000 at present count), and the ambassador says the new government is cooperating with Washington in the matter of sending them home. Ambassador Fadera was a former head of the Gambian civil service in the new administration until 2018, when he was appointed to his first ambassadorial post. Diplomatic Connections: In 2017, the political situation changed dramatically in your country when The Gambia’s long-time autocratic leader, Yahya Jammeh, spectacularly lost an election to Adama Barrow who became president, restoring democracy and freedom of expression. So now, two years later, how is that restoration progressing? Ambassador Fadera: It has been very difficult. The former president, who ruled for 22 years, had essentially dismantled all of the country’s democratic institutions. For its first 30 years (of independence), The Gambia had been a shining example of democracy in Africa, and a leading light in the respect for human rights and protection of liberties, but all that went out of the window. We had one of the worst dictators in Africa; a lot of Gambians lost their lives, lost their property, their liberty, and Gambia was more like a big prison -- everyone was serving in it, and the only guard was the former president. During that time, our progress towards development really took a battering. When the new government took over, they inherited a government that was completely bankrupt. The dictator took all the money away that he could lay his hands on. We also inherited a huge debt portfolio amounting to well over 130 percent of our gross domestic product (GDP). Most of this is nationally held  because when it got to the point that the international institutions stopped their loan support, he reverted to borrowing domestically from people within The Gambia. Diplomatic Connections: It is so that the international financial institutions had cut off contact with Gambia? Ambassador Fadera: That’s what happened. Towards the end of the regime, the government was completely isolated. We left the (British) Commonwealth, we left the ICC. We were weak in ECOWAS (the Economic Community of West African States). The World Bank and the International Monetary Fund wouldn’t have any programs with Gambia. This new government took over facing all these big problems. We have made some progress in terms of governance. The media landscape has changed in The Gambia, press freedom is back – people can write as think fit, within the law – political parties are now up and running, seven parties and one independent candidate form are in the coalition government. In the past two years we held a cycle of elections that were highly subscribed ranging from legislative to local and municipal elections, marked by spirited debates and unprecedented youth and women participation at all levels of the processes. These were monitored both by local and international observers successfully administering a clean bill of health. The rule of law is back. The judiciary is completely independent now; a couple of times in the past two years Gambians have taken the government to court and won. That was unthinkable for 22 years. Diplomatic Connections: With President Barrow committed to a three-year term, wouldn’t you agree that the clock is ticking for the presidential government? Ambassador Fadera: The coalition members got together among themselves and agreed to a transitional government to run for three years, after which they can go for elections. But that now seems too short. There’s a national debate at home whether to go for five years or three, and it looks like we are heading for a five-year term. The old constitution had been amended by the dictator to the point of abuse, so the country has already put together a constitutional review committee. Its terms of reference are to come up with a brand new constitution that will respond to our current and future needs. That’s ongoing right now, and we will have a new constitution and a new republic. It’s a very exciting time for The Gambia and its citizens. Diplomatic Connections: There has been mention of a truth and reconciliation commission. Has that been established? Ambassador Fadera: It’s already formed, and its hearings are televised. It’s imperative that we heal the wounds that were inflicted during the past 22 years. We are hoping that people will come forward, tell the story, and seek forgiveness. But part of the commission’s work is also to help establish some standards for paying reparation – damages – to people who have been unduly affected by the past regime. Of course, that is ongoing and has international support. Diplomatic Connections: According to your biography, you yourself had problems with the previous regime. Were you not fired from your job, but brought back because things worked better with you in charge than without you? Ambassador Fadera: The former dictator had problems with almost everyone in the country. Once you didn’t agree with his ideas, you either had to resign, or be fired. A lot of people were taken out and brought back because he realized that for the public service to function properly, you need people with experience, capacity and integrity. Diplomatic Connections: Yahya Jammeh refused to leave after losing the election, and ECOWAS dispatched troops to force him into exile? Are those troops still in The Gambia? Ambassador Fadera: Yes. They are still helping to maintain peace and security in the country. In December 2016, when the election results were announced and the electoral commission declared the leader of the opposition, Adama Barrow, as the winner, President Jammeh actually accepted the outcome, but a few days later he changed his mind. He rejected the results in their entirety and called for fresh elections. So the Gambian people came together to say ‘no.’ There was a lot of internal struggle against him, and then ECOWAS put a military force together and they were at the border when (Jammeh) saw this was a serious business, and he agreed to go. The United Nations also passed a resolution supporting the people of Gambia. Diplomatic Connections: How did ECOWAS get involved? Ambassador Fadera: ECOWAS is one of the best regional blocs in Africa and really stands for democracy. In the past, West Africa had suffered greatly from endless military coups, which greatly affected the development trajectory of the region. The West African nations came together to say no to military coups, no to unconstitutional changes of government, and no to leaders who would disregard the people’s will at the polls. ECOWAS has also intervened in Mali and Cote d’Ivoire. Diplomatic Connections: Is there a time frame for how long the ECOWAS will remain in The Gambia? Ambassador Fadera: This is left to the governments to work out, and there are funding implications as well. They will study the situation, and I think they’re going to extend their presence for one more year. Hopefully, very soon, we might not need them. This will depend on the security situation at home and consultations between the Government of The Gambia, Governments of the ECOWAS Region and partners. Diplomatic Connections: What would you like to see the United States do to help this restoration effort? Ambassador Fadera: I’ve met many U.S. government officials and my message has always been for them to come forward and give Gambia stronger support in our reform. We see what’s happening in Gambia today as a model for Africa. We were almost on the edge of a bloody civil war that would have destabilized the entire sub-region, but the way the Gambian people organized themselves and handled it – they put their faith in democracy. So I tell officials that this is a time to work together and give Gambians the dividends of democracy. We’re not necessarily asking for handouts, but at least one way that the U.S. can help is to improve investment in the country. The youth population is huge, unemployment is very high, and the government alone can’t create employment for everybody. So that’s why we call upon the United States and other countries that mean well to come forward and invest in our nation. As a government we’re doing what we can to attract investment. People can come forward and have faith in the judicial process and invest in our nation. We also have attractive incentives for people who want to invest in The Gambia; it’s a small country but strategically located. From the Gambia you can target the population of ECOWAS, which is 15,335 million people constituting one third of the total population of sub-Saharan Africa. All the resources are there, and we’re five hours from Europe. Diplomatic Connections: In other respects, how would you characterize bilateral relations with the United States? Ambassador Fadera: They’re very strong right now. We are very grateful to the current U.S. government in that immediately after the change (Washington) made two important restitutions. One was to reinstate us in the Millennium Challenge Corporation Threshold Program, which is extraordinary and of great significance. The other was to put us back in AGOA (Africa Growth and Opportunity Act). This is a powerful show of confidence in the new government, and we are very happy about that valued reassurance. Since then, we have been in consultation with various state and non-state actors here in the U.S. and the outcome is very positive. 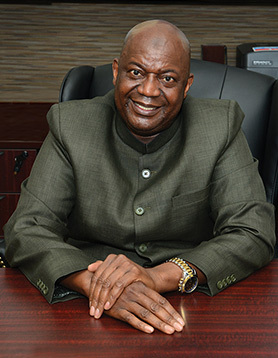 Diplomatic Connections: One of President Barrow’s first trips abroad was to China where he signed a number of bilateral agreements. How strong is China’s involvement with The Gambia? Ambassador Fadera: We have very strong bilateral relations with China, and that’s working out well. The Gambian people really yearn for the dividends of democracy. But, for the past 22 years we’ve had a huge infrastructural gap in the country, and huge unemployment. With the change, people thought that it would bring them at least job opportunities, bring them growth, some infrastructural development, bridges, and a private sector employing more people. The expectations are very high. With China, it has been much easier in terms of negotiations and getting things started. China has already offered to build a conference center that cost about $16.5 million. That’s happening as we speak. The Gambia is poised to host the OIC Summit in 2019, and the Chinese are generously providing the conference center as a grant for the country. China has very strong ties with the continent. The huge African Union headquarters in Addis Ababa was built by the Chinese government as a donation to the African Union. Many, many highways and railways across Africa are built by the Chinese. Diplomatic Connections: What has been the most significant economic development since the change? Ambassador Fadera: When the new government took over our reserve in the Central Bank for import cover was less than two weeks; currently, that has been increased to more than three months. That brings confidence in the economy, and our currency is now stronger and competes against major currencies. The prices of basic commodities have not skyrocketed as people thought they would when the exchange rate control mechanism was liberalized. Fuel prices, once controlled by the dictator, now follow global fluctuations. Quite a number of roads are being marked out for expansion in the Banjul area as part of the OIC conference scheme. But the major achievement in the past two years is in the governance area. The economy has not improved as fast as Gambian people would like it to; what we need in terms of investment has not been met. Investments are trickling in, and hopefully this will change. Tourism is doing very well. For the past two years, the number of people wanting to vacation in The Gambia far exceeds the number of available hotels. Gambia has a diverse ecotourism, and is a paradise for bird watchers as we have several different species of birds. As part of diversifying tourism, new markets are being discovered. Diplomatic Connections: The economy is based on agriculture – particularly groundnuts – tourism, and also remittances from the large number of Gambian emigrants. But as things improve, presumably many will want to return. How does one cope with an influx of returnees? Ambassador Fadera: The contributions of the diaspora are important to our economy, but the government has now put together a strategy study to get the diaspora to get to come home and invest in the country. Diplomatic Connections: Isn’t The Gambia getting help from the European Union which has contributed  $278 million for Gambian repatriations? Ambassador Fadera: Yes. Many members of the diaspora have been exposed to more education, and they have experience and skills. We want them to come home and start investing in the country. Some have already responded to that call, and have returned home to start various activities. Certainly, the country will miss the remittances, but they are engaging in something else that would help create wealth in the country. It’s a delicate balancing act, but the government is working on it. We’ve put together a strategy to engage our diaspora to make their contribution more effective. Diplomatic Connections: How many Gambians are there in the United States? Ambassador Fadera: We have a huge number of Gambians in the United States. We don’t have the updated figures, but it is estimated that well over 22,000 Gambians live in the U.S. In the past the diaspora had very poor relations with the dictator; he saw them as enemies of the people, so the embassy here wasn’t able to establish a data-base because immigrants tried to avoid the government. Although I can tell you the Gambian community is huge. They live in Maryland, Seattle, New York, Atlanta, Minnesota, North Carolina and elsewhere. 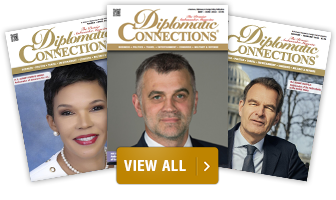 Diplomatic Connections: Just one final question: What would be your advice to an incoming African fellow ambassador, who has just arrived, about operating in Washington? Ambassador Fadera: Washington is an important mission for any country. I came in and I really didn’t know where to start. But then with the help of my staff here on the ground, we came up with a strategy of engagement without key partners and allies. I’ve gone out aggressively to meet them, introduce myself and my platform to seek their support. The African Union ambassadors meet regularly which is also very helpful for new diplomats. In fact, Gambia has introduced a proposal for the African Group of Ambassadors to develop rules of procedures and a guidebook for incoming diplomats to facilitate interactions within the complexities and the hustle and bustle of Washington, D.C. This has been adopted and I will be the Chair of the Committee leading this process. It will have the key institutions, the addresses and phone numbers, key events that people can attend and engage with other diplomats. The Gambia will take the lead with the AU to publish it.